This is fabulous!! Love how you used this pretty collection to make a patchwork quilt!! Perfect for a baby card!!! Your card is simply perfect, Lisa, definitely brings to mind snuggling and cuddling! This is beautiful! LOVING all the different patterns!!!!!!!! ooooo Another FAVE!!!! Love the quilty look. 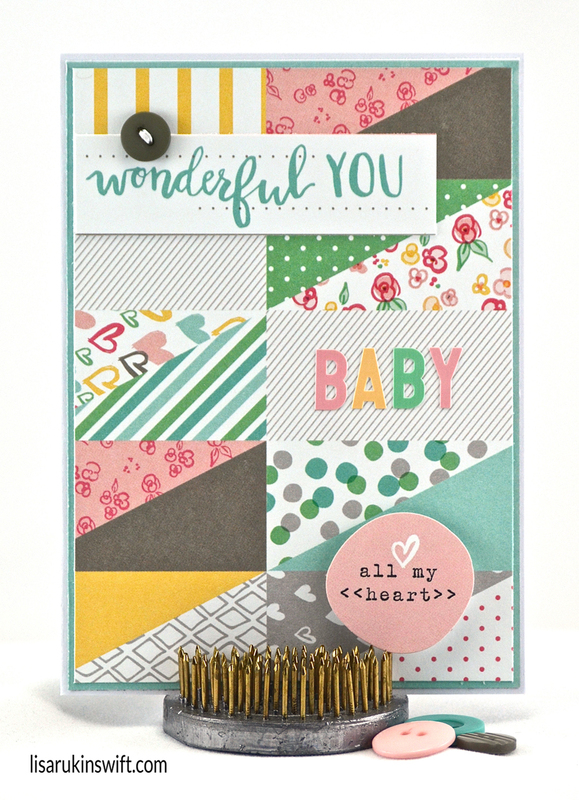 This is such a soft and beautiful baby card - yes I smell baby powder and new baby smell as I look at this!! Baby is wrapped up in this gorgeous baby quilt!! What an amazing card for a new mommy!! Love the ALL MY HEART sticker because that is what we give to our little ones the first time we hold them!!! Oh, you are right, Lisa. That paper is PERFECT for baby cards. This one is so sweet. I love everything about it!